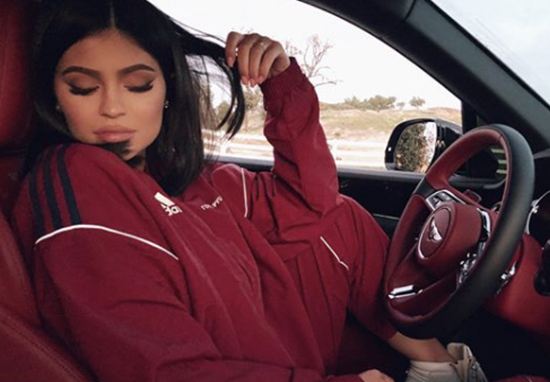 Kylie Jenner has been relatively off the radar for some time since she became pregnant with her daughter Stormi. She is certainly more active on social media since her birth, but we’re still not seeing the same amount of Kylie as most of us are used to. And now, because it’s been two weeks since the last rumour about the youngest Jenner sister, fans are convinced there’s something else she isn’t telling us. On Tuesday night, both Kylie Jenner and her baby daddy, Travis Scott, headed out for a meal of chicken and waffles in LA. The parents were seen leaving Sweet Chick, a Hollywood restaurant, but the reality star accidentally slipped out something quite revealing. On her wedding finger was a ring, which is apparently not uncommon for her to wear on that finger, but fans reckon this band is suitably glamorous – it looks like a diamond effort no less – that it must be a legit engagement or wedding ring. This isn’t the first time Jenner fans have been ‘convinced’ she is engaged, after she posted a diamond ring on her wedding finger on social media, so it could well be that Kylie is married now. In the image, her hand was placed on the top of the steering wheel of her Bentley, but fans were only focusing on her ring finger, which had some serious sparkle wrapped around it, according to The Daily Mirror. The cosmetic and social media mogul has been incredibly quiet on Instagram since it was revealed she was expecting – but most of us would chalk it up to fear of systematic criticism pregnant women and their baby bumps face from keyboard warriors. However, Kylie has previously dropped hints she wouldn’t be so active online if she became a mum, saying she’d prefer to immerse herself in a quiet family life, and it looks like she’s sticking to that promise. You know, I’ll probably delete my Instagram and just… I don’t know, live life. Saying that, she does have a multi-million dollar cosmetics empire which largely relies on her social media presence so there is that incentive not to ditch the ‘gram just yet. And her significant downturn in social media output isn’t to say that she isn’t posting at all – far from it! She is still keeping her scores of fans in the loop about her baby, including with a post to mark the one month anniversary of her baby’s birth. So that quiet life without the phone is looking a little unlikely, tbh.